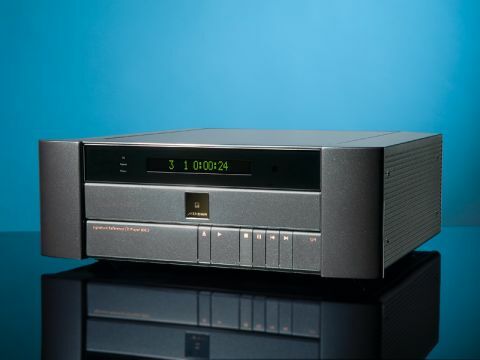 Meridian has been at the forefront of CD player technology since 1984 and the 808.3 Signature Reference is its flagship disc spinner, so no digital stone has been left unturned in the quest to make its third incarnation the ultimate. As early pioneers in technology to reduce the 'ringing effect' of conventional digital filters, the 808.3 makes use of the latest apodising filters and resolution enhancement DSP technology. Equally significant for Meridian devotees is the 808.3's ability to operate as a bridge or front end for a Sooloos digital media system and to send a digital signal to a pair of Meridian active DSP loudspeakers. The finishing touch is that this is not just a CD player, it's also a preamplifier with digital and analogue inputs. The 808.3 looks pretty much like its predecessor, so we asked Meridian's Bob Stuart what had changed since the 808.2. He said that having developed the apodising filter – one that's designed to eliminate pre-ringing in both the digital signal being read off the disc and the ringing produced by filters in the original recording – the software was totally revised in the original 808. For the 808.3, Meridian has revised all the hardware that runs that software. So the DSP (digital signal processor) remains the same, but the analogue and digital outputs are new and the reference oscillators or clocks have been totally redesigned. This player still uses a three-stage FIFO clock circuit, but it's a totally new one. Even the transport has been changed to a CD-ROM drive made specifically for Meridian by TEAC, so although an upgrade will be available to take 808.2 players to 808.3 status, it will be a relatively expensive one. The other significant change is that unlike the earlier version, the new player has a Sooloos board installed as standard, making this machine the highest-resolution playback device available for Meridian's media player. The Sooloos card will play files at up to 24-bit/96kHz, but more importantly, it means that it's possible to compare CD and streamed files on a level playing field, which makes it pretty well unique. Having spent a lot of time with high-resolution audio developing MLP for DVD-Audio, Meridian has been working on ways to get a hi-res result from CD because of its massive depth of catalogue – after all, no other 'decent' format comes close. For this purpose the 808.3's transport employs a multiple pass ROM drive, in order to recover as much data as it can and uses the aforementioned triple-stage clock circuit to bring jitter levels down to vanishing levels. It then upsamples CD's 44.1kHz to 176.4 and uses its apodising filter to remove any pre-echo or ring with minimum phase. To say that this player is a technical tour-de-force is an understatement, it is bleeding-edge, state-of-the-art. In terms of the user interface, it's not entirely conventional, either. There is, for instance, no 'on' button. Instead you need to select play or eject from the front panel or choose your source from the enormous, button-festooned, desk-top style remote. Given the level of technology it controls, a touchscreen handset would seem more appropriate. You can, however, change the legends by changing the buttons on the handset. You can also operate the preamp from the unit itself by opening a flap above the control keys. The back panel is quite involved too, with unconventionally arrayed analogue inputs lacking even the usual red and white channel indicators. The 808.3 is not built in the usual high-end style, there are no elaborately machined slabs of aluminium nor dangerously spiked feet, construction is more akin to the interior of a plush car. There are three standard finishes, plus a range of Meridian Select colours. This sets the player apart from the crowd, although due to its size we couldn't fit it into the slots on our rack, so it had to sit on top. But build is clearly first class and flexibility in a different league to most – you'd have to look to Naim's HDX or the Resolution Audio Cantata to come close. But that flexibility is a good deal more useful in a full Meridian system than elsewhere; few others make active speakers with a digital input for instance. While it is fully equipped for custom install and the Meridian Sooloos media player, it doesn't have anything as basic as a USB input, so you are stuck with relatively expensive routes on the streaming front. That said, this is not a budget product. It is designed to work in high-end systems be they of the same make or otherwise. In the latter case, the onboard preamplifier is very useful, with its six analogue and five digital inputs it is better equipped than many standalone preamps. It's slew of Meridian-specific features makes it hard to put a value on in terms of features and build per pound, but you are undoubtedly getting top-notch technology for your money and a system that is as future-proofed as they come. Once warmed up, the 808.3 bathes you in detail whatever the disc and the better the recording, the richer the soundstage becomes. Keith Jarrett's Jasmine is a simple piano and double bass recording, but the sound it reveals is almost orchestral when the full harmonic structure of each instrument is exposed. It is also great to be able to enjoy the subtleties of timing that the two musicians display so fully, this player is nothing if not great at revealing fine detail. This applies to spatial information too, you can hear all the phase shifts on Radiohead's In Rainbows, the degree of manipulation of which being far more extreme and dynamic than most players let you hear. Swapping from the RCA phono to XLR balanced outputs gives you more power and even great image depth with no apparent trade-off so this is the way to hook up the player if you have the option. The more we listened, the more we heard with this player, it's uncannily good at exposing the notes that other players can't reach – sounds that are usually masked by louder ones in the mix being particularly apparent. It also allows you to pick out individual instruments or voices and follow them alone or to listen to the music as a whole which is a very good sign. With Kraftwerk's Tour de France, the vocal is etched into the air between the speakers, shaped and focussed to a degree that's not often encountered and this reveals a lot about the quality of recording in the first place. What's perhaps even more impressive is the way this player deals with less spectacular recordings. Metallica's Black album is quite a nasty-sounding lump, but the 808.3 manages to distract you with some of the most formidable bass on record. It can't remove the excessive compression, but does highlight the way that the drums were recorded for maximum buttkickage and sifts out the many layers of guitar overdubs used to create the 'thickener' effect that proved so influential. The above results were achieved in a system fronted by PMC fact 8 speakers and powered by a Gamut D200 MkIII power amplifier using the 808.3's onboard preamp. Moving the player into another system with ATC active speakers proved less successful, because the Meridian didn't play to that system's skills of dynamics and timing, but it made the most open sound that this system has yet produced with CD. Which proves that however good a source is, it needs the right ancillaries to be able to strut its stuff. In some ways, the 808.3 is a player for the intellect more than the emotions, its sheer resolution can distract you from the tune, but it keeps you fascinated and allows you to enjoy the older and less sonically appealing albums in your collection. If you want to hear precisely what's going on in a composition and enjoy an uncannily open soundstage then the Meridian 808.3 is in a very small minority of top-notch players.